With the upcoming test flight of the Ares IX, there is lots of talk about high vibration levels and design problems with the big solid first stage. One common misconception I've noticed (and pointed out) a couple times is that folks think Ares I might have pogo oscillations. 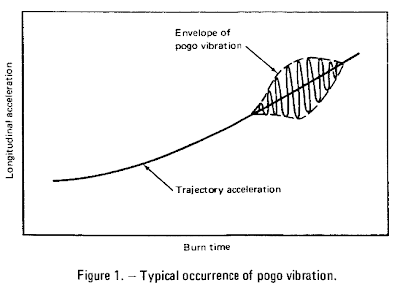 Pogo oscillations are a specific type of propulsion-structure interaction that occurs in liquid rockets, not solids. Many liquid rocket vehicles have experienced longitudinal vibration because of an instability arising from interaction of the vehicle structure with the propulsion system. The vibrations, nicknamed ``pogo'' after the jumping stick, have occurred principally in the first longitudinal structural mode during operation of the first liquid-propellant stage of a launch vehicle. 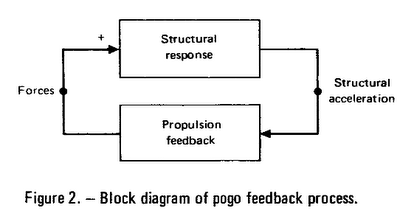 From the same report, here's a figure of the accelerations characteristic of pogo. The dynamic instability being described here is not simply resonant forcing. There is a positive feedback loop. A block diagram of the positive feedback process which can lead to instability is shown in figure 2. Structural vibratory accelerations induce the propulsion system to generate forces which can then intensify the original vibration. When the system becomes unstable, oscillations will appear spontaneously. Rubin gives a further description of the two types of pogo. Two basic kinds of propulsion-system behavior have produced pogo instability. The common form of pogo, called engine-coupled pogo, has been experienced to a significant degree on certain configurations of the Thor, Titan, and Saturn space vehicles. This form results from the action of the tank-to-engine propellant feed-lines and the engine itself (fig 3.) When the vehicle vibrates longitudinally, the pump and the propellant in the flexible tank undergo oscillatory motions. These two motions produce oscillating flow in the feed-line and in the pump's discharge line. The flow oscillations lead to oscillations in engine thrust and in pressure at the pump inlet, which then act as regenerative forcing functions on the vehicle structure. The feedback loop is thereby closed. 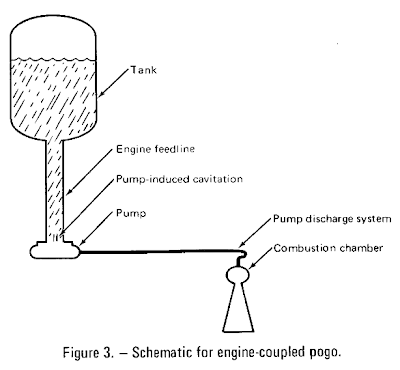 Although a pump is included in figure 3, pogo can also occur in pressure-fed systems. 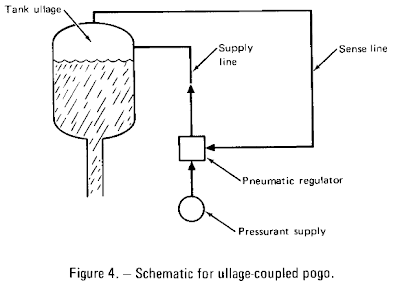 A much less common form of pogo results from the pneumatic behavior of an active pressurization system for the propellant tank ullage. This form is known as ullage-coupled pogo, and has been experienced only on Atlas vehicles immediately after liftoff. It has also been referred to as pneumatic-coupled pogo, or ``bloating''. A simplified schematic of an active pneumatic system for pressurizing a tank is shown in figure 4. When the vehicle vibrates longitudinally, the tank ullage pressure oscillates because of oscillation of the ullage-volume boundaries. The sense line transmits the pressure oscillation to the regulator. The regulator responds by producing an oscillatory flow of pressurant (i.e., the pressurizing gas) into the supply line which regenerates the ullage-pressure oscillation that acts as an axial forcing function on the vehicle structure, and again the feedback loop is closed. The big SRB being contemplated for use in Ares I probably does have lots of combustion instabilities which will cause some wicked forcing on the rocket. It may even couple well to the rocket's lower longitudinal modes, but that is not pogo. There is no positive feedback there, just lots of hammering on the structure (and the astronauts). Blogs are a great place for throwaway code. You write throwaway code to learn about solving a particular problem. For me, it is usually implementing different sorts of numerical methods. Posting the results to the web just provides a bit of a goad to pick something interesting and work it to completion. Who knows, it may turn out to be useful to someone else too. Do the symbol manipulation required to apply the chosen discretization or approximation to the governing equations. Export appropriate computation-ready expressions to your favorite language (I use Maxima’s f90() function). Find an analytical solution or generate forcing functions for a manufactured solution using your CAS. Write the auxilliary code to turn your expressions into useful routines and functions (loops and logic statements). Compile and verify that the implementation meets the design order of accuracy with a grid convergence study. Becoming fast at going from governing equations to a formally verified implementation is important. According to Philip Greenspun fast means profficient, and formally verified means you aren’t fooling yourself. Does the little numerical methods throwaway code process described above satisfy these criteria? Learning and implementing a new method on an old equation set or an old method on a new equation set seems to be intended to improve performance. Since it is a new method it is just beyond the level of competence (you haven’t implemented it successfully yet). The critical feedback comes from passing the verification test to confirm that the implementation meets the design order of accuracy. Which brings us finally to the repetition level. Getting high levels of repetition is a bit harder. For simple governing equations and simple methods (like this example) it will take a very short time to go from governing equations to verified implementation. But part of the progression of the competence level is extensions to more complicated equations (non-linear instead of linear, multi dimensional instead of one dimensional, vector instead of scalar), which can take quite a while to get through the entire cycle, because the complexity tends to explode. Just getting practice at using the available software tools is important too. They are increasingly powerful, which means they come with a significant learning curve. If you want to solve complicated PDEs quickly and correctly, being proficient with a CAS is the only way to get there. The (open source) toolset I like to use is Maxima + Fortran + F2Py + Python (scipy and matplotlib especially). The symbol manipulation is quick and correct in Maxima, which produces correct low-level Fortran expressions (through f90()). Once these are generated it is straightforward to wrap them in loops and conditionals and compile them into Python modules with F2Py. This gives you custom compiled routines for your problem which were mostly generated rather than being written by hand. They are callable from a high level language so you can use them alongside all of the great high level stuff that comes in Scipy and the rest of Python. Especially convenient is Python’s unittest module, which provides a nice way to organize and automate a test suite for these routines. The Radau-type Runge-Kutta example I mentioned earlier is a good example for another reason. It is clearly throwaway code. Why? It has no modularity whatsoever. All of the different parts of the calculation, spatial derivatives, forcing functions, time-step update, are jammed together in one big ugly expression. It is not broadly useful. I can’t take it and use it to integrate a different problem, it only solves the simple harmonic oscillator. I can get away with this monolithic mess because the governing equation is a simple one-dimensional scalar PDE and Maxima doesn’t make mistakes in combining and simplifying all of those operations. In real production code those things need to be separated out into their own modular routines. That way different spatial derivative approximations, different forcing functions, different time-integration methods can be mixed and matched (and independently tested) to efficiently solve a wide variety of problems. Making sure that your throwaway code really is just that means you won’t make the biggest mistake related to throwaway code: not throwing it away. You can use the g3data software to pull data points (that's what I did) if you want to run your own analysis with R. Does a simple statistical analysis support the claim that "there seems to be a downward trend"? The R to generate the above graph is shown below. And here's the summary table for the linear model. What does that model summary output mean? 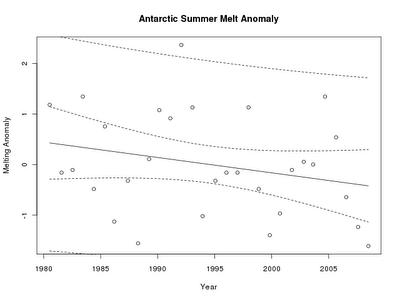 There really is NOT a significant downward trend of melt anomaly with years (there's no first order trend in fact). It's not measurably different from noise. How does this square with the recent reports of runaway melting though? The public is not well served by this constant drumbeat of false alarms fed by computer models manipulated by advocates. These recent posts about climate change stuff were inspired by a post I read about climate change skeptics, which I found because of my Google alerts on things related to 'computational fluid dynamics'. In the post she mentions Freeman Dyson, he's a pretty smart guy. Concerning the climate models, I know enough of the details to be sure that they are unreliable. They are full of fudge factors that are fitted to the existing climate, so the models more or less agree with the observed data. It is much easier for a scientist to sit in an air-conditioned building and run computer models, than to put on winter clothes and measure what is really happening outside in the swamps and the clouds. That is why the climate model experts end up believing their own models. Mort Webster, assistant professor of engineering systems, warned that public discussion over climate change policies gets framed as a debate between the most extreme views on each side. "The world is ending tomorrow, versus it's all a myth," he said. "Neither of those is scientifically correct or socially useful." I previously did an analysis of JASSM's reliability using Octave. It's a very simple exercise using the built-in Octave function empirical_rand() and public statements by various folks concerning the flight tests. As reported by Reuters, JASSM has had success in recent tests. To be quantitative, 15 out of 16 test flights were a success. Certainly good news for a program that's been bedevilled by flight test failures and Nunn-McCurdy breaches. The previous analysis can be extended to include this new information. This time we'll use Python rather than Octave. There is not (that I know of) a built-in function like empirical_rand() in any of Python's libraries, but it's relatively straightforward to use random integers to index into arrays and accomplish the same thing. Applying this function to our new data vectors to get bootstrap samples is easy. So, is it a 0.9 missile or a 0.8 missile? We should probably be a little more modest in the inferences we wish to draw from such small samples. 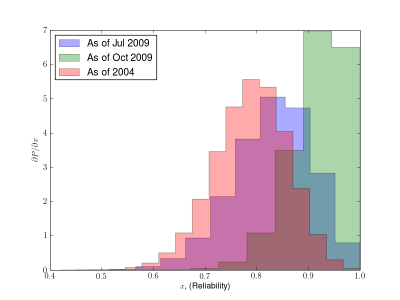 As reported by Bloomberg the Air Force publicly contemplated cancellation for a missile with reliability distributions like the blue histogram shown below (six of ten failed), while stating that if 13 of 16 were successful (the green histogram) that would be acceptable. 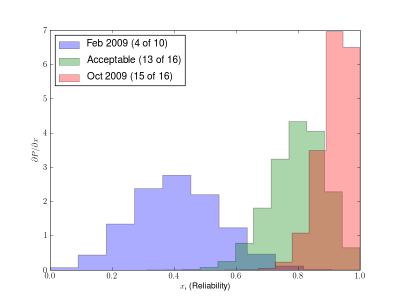 The figure below shows these two reliability distributions along with the actual recent performance. This seems to be a reasonably supported inference from these sample sizes, the fixes that resulted in the recent 15 out of 16 successes had a measurable effect when compared to the 4 out of 10 performance. Not that binary outcomes for reliability are a great measure, they just happen to be easily scrape-able from press releases. 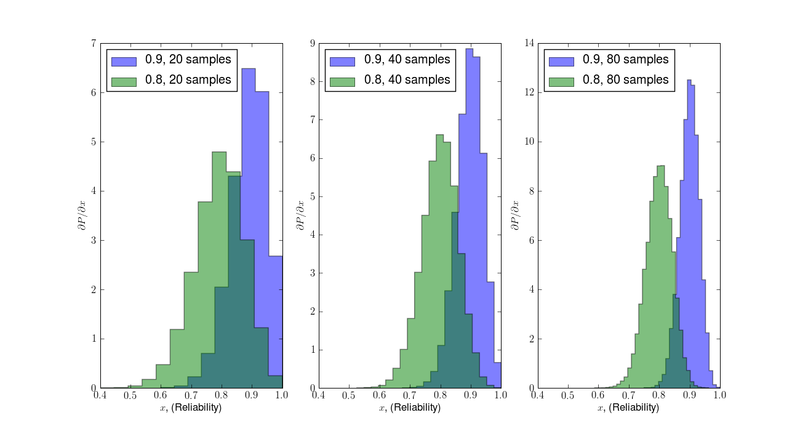 The figure below illustrates the problem, there just isn't much info in each 1 or 0, so really cranking up the number of samples only slowly improves the power (reduces the area of overlap between the two distributions). While I don't appreciate most of the pseudo-religious global warming hysterics, I can't say the recent BBC piece on 'global cooling' is anything but sensationalism. It's curious that they don't just show their readers a simple graph of the data. I don't know about you, but the recent years that they are claiming show a cooling trend look well within the expected variability. The solid line on the graph is a simple linear regression, the inner dashed lines are a 0.95-level confidence interval and the outer dashed lines are a 0.95-level prediction interval. The prediction interval gives a range of where you would expect temperature measurements to fall based on the fitted trend and residuals. 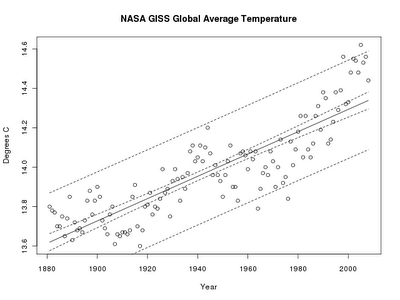 You can download the NASA temperature data yourself and have a look. In case you're interested here's the summary of the fitted model shown in the graph. 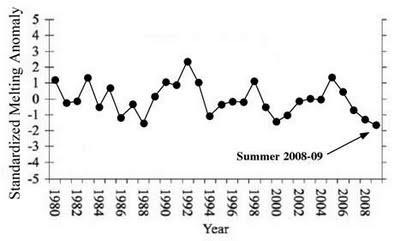 Just looking at the graph shows there's probably something more complicated than just a linear trend going on though. To be fair, the BBC piece does go into greater detail that it isn't really global cooling, that the Pacific Decadal Oscillation might be starting to kick in, so we'll probably see a little 20 year dip like that between 1940 and 1960. I'd say you need a few more years of data to actually be able to call it though (kind of like calling an economic recession). Implicit Runge-Kutta methods are interesting because you can get high-order accuracy with relatively few stages. 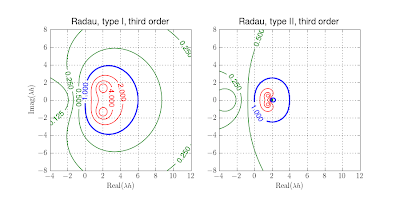 A method based on Radau quadrature that is third order accurate and L-stable has only two stages. A comparable multi-step method based on a backward difference that requires saving two steps is only second order accurate. The method is applied by calculating several slopes at various points and then adding a weighted sum of them to the initial condition. L-stable methods are particularly important for stiff problems. These often occur in chemical kinetics or turbulent flows. Also, Chebyshev pseudospectral methods for PDEs introduce really large eigenvalues which are not very accurately approximated, so damping them is advantageous. Since the system is linear we can actually invert the operator analytically and solve for the update. Of course the reason this type of time-integration is not very popular is because often you can't analytically invert the system. For nonlinear problems the size of the system that must be iteratively solved is twice as large (for a two-stage method) as the previously mentioned second order backward difference method. The numerical solution is compared to the analytical solution for several time-step sizes. 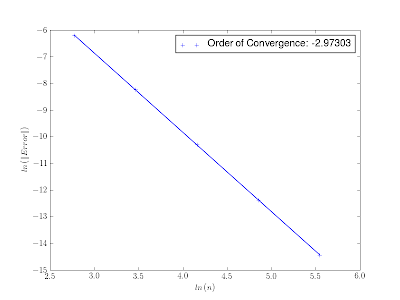 The observed order of convergence (2.97) matches the design order (3) pretty closely. Check out Computer Methods for Ordinary Differential Equations and Differential-Algebraic Equations and Solving Ordinary Differential Equations II: Stiff and Differential-Algebraic Problems for some pretty detailed coverage of these and other advanced integration methods. Also see this page with Fortran implementations of several of these types of methods. The technical people [must] keep their hands dirty and actively work on in-house projects selected specifically for the purpose of updating their knowledge and increasing their competence. The ultimate goal and purpose of astronautics is to gain for man himself access to space and then to other worlds. The guided missile does not carry a man. It is a bridge between the space-flight concepts at the beginning and the space-flight reality yet to come. -- General Dynamics/Astronautics, Centaur Primer: An Introduction to Hydrogen-Powered Space Flight (San Diego, 1962), pp. x-x1. Missile's and drones are boring, you gotta stick a warm body in that thing to get any sizzle for your steak (rule 153)! Probably the least appreciated, but most important aspect being the knowledge you can only earn by actual operating the hardware "in anger". Making sure that the guys who designed this one, will be able to benefit from insight gained from fielding to design the next one is pretty crucial. When you have decades long development programs, that loop just aint gonna close.